Ken-Ohki is Nagi's cabbit partner. Like Ryo-Ohki, Ken-Ohki can transform himself in a space battleship, although the configuration and color is slightly different than Ryo-Ohki. And like Ryo-Ohki, Ken-Ohki has developed a love of carrots. 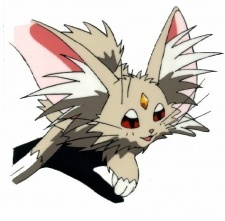 Ken-Ohki and Ryo-Ohki also love each other, which complicates Nagi's almost obsessive quest to capture Ryoko. But this love had also saved Nagi from being killed by Ryoko, not to mention aiding Ryoko when she, Tenchi, and the knights Azaka and Kamidake stormed the Jurai palace to save Ayeka.